Build your own Bundle of mags at half-price! Well, no, you can’t. Logistically, we’d go nuts trying to figure up the cost of, say, the KIRBY COLLECTOR ULTIMATE BUNDLE, less 7 random issues that you already own, then try to figure up one for your neighbor who has all but 3 of the issues, and so on, and so on. 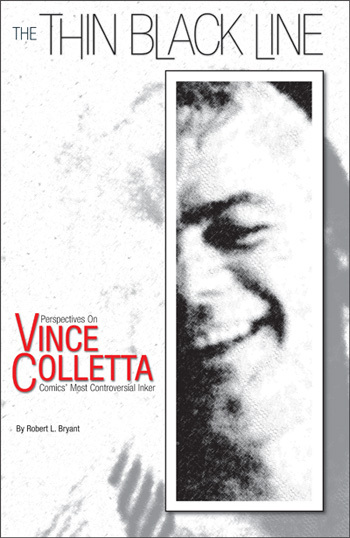 plus other miscellaneous humor and one-shot magazines, all at 50% off cover price. We’ve even got a select group of books that are also 50% off during the sale. But you HAVE TO order at www.twomorrows.com by the end of June to get this deal. AND PLEASE BE PATIENT!!! We’ve already been inundated with orders for this sale, and while we normally get orders shipped within a day or so of being placed, we’re currently running about 3-4 days later than usual on shipments. We’re working overtime to get to them all, and if you’ve paid extra for Priority Mail shipping, we’ll fill yours first in each batch that’s processed. This entry was posted in TNT on 10 June 2010 by Mr. Morrow. Our pal and do-everything-guy Eric Nolen-Weathington just got back from Charlotte, NC, where he manned our booth at Heroes Con (still one of our all-time favorite conventions). Here’s a big shout-out to everyone that came by the booth; sales were brisk, and according to Eric, the conversation was fantastic as usual at our booth. Before Comic-Con, BrickJournal editor Joe Meno and I will be at the BrickWorld LEGO convention in Chicago, and then I’ll be taking a week off with the family, plus working in a trip to the Grand Canyon with our kids on the way to Comic-Con. As usual, it’s going to be a fun, fast-paced summer, and will be over way too soon, but I plan to enjoy every hot, steamy minute of it, wherever I am. Hope you do too! New cover art for Back Issue 42, pahdnuh! 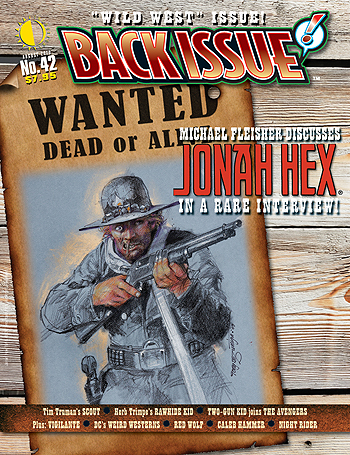 We’re about to go to press with Back Issue #42, our “Wild West Issue”, and had a perfectly lovely Tony DeZuniga cover illo of Jonah Hex all planned for it, when we designed it several months ago. But back then, we were working from a less-than-optimal scanned image, which worked fine for the small promotional images we use, but wouldn’t repro well at full size. We thought we’d be able to get a better scan by presstime, but alas, it didn’t happen. So, the above is our NEW cover art for issue #42; still Tony DeZuniga art, still Jonah Hex, but one that’ll reproduce up to our standards. And hey, I think it’s arguably an even more dynamic cover than what we’d originally planned. Kudos to designer Michael Kronenberg for the new layout, and to editor Michael Eury for tracking down this alternative DeZuniga image. And don’t miss the new interview with controversial Hex and Spectre writer Michael Fleisher in this issue. 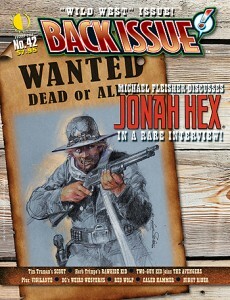 He’s been missing from the comics scene for around 20 years, and some people even thought he’d gone to the Great Beyond, but we’re happy to report he’s alive and well, and gives us great insight into his work on Jonah Hex.